In this third tutorial in our Layers Learning Guide, we look at the Layers Panel Options dialog box in Photoshop and the settings that let us customize the look of the Layers panel and keep us working more efficiently. In this tutorial, we'll take a quick look at a few simple ways you may not be aware of for customizing your Layers panel in Photoshop to keep it free of unwanted clutter and create a cleaner, more efficient workspace. I'll be using Photoshop CC here, but these tips will work with any recent version of Photoshop. 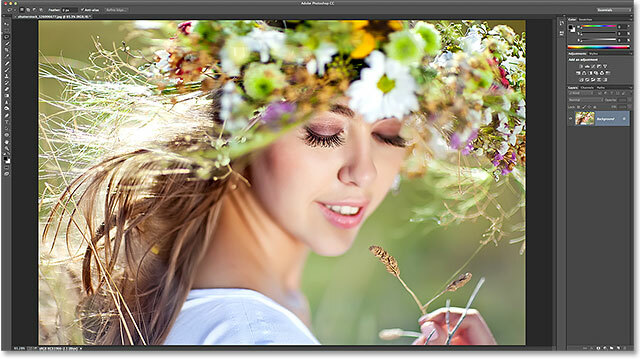 This tutorial is Part 3 of our Photoshop Layers Learning Guide. An image open in Photoshop CC. The preview thumbnail in the Layers panel. Choosing the Large thumbnail size. Larger thumbnails make it easier to see the layer contents, but do take up more room. Right-clicking (Win) / Control-clicking (Mac) below the Background layer to change thumbnail size. While larger preview thumbnails can make it easier for us to see the contents of our layers, layer mask thumbnails can often clutter up our Layers panel for no good reason, especially when it comes to Photoshop's Fill and Adjustment layers. By default, every time we add a new Fill or Adjustment layer to a document, Photoshop includes a layer mask with it in case we need to target only a specific area of the image. For example, we may add a Levels or Curves adjustment layer specifically to brighten someone's eyes or whiten their teeth, and in that case, we'd need the layer mask to target only the areas that need to be affected. Layer preview thumbnails serve a purpose, but mask thumbnails? Not always. The Solid Color, Gradient and Pattern Fill layers. Unchecking "Use Default Masks on Fill Layers". Clicking the Adjustments panel menu icon. Selecting the "Add Mask by Default" option to turn it off. Adding another Levels adjustment layer, this time without the default mask. Adding a layer mask manually to the Levels adjustment layer. The mask thumbnail is back, but by our own choice, not Photoshop's. Does seeing the word "copy" so many times really tell us anything useful? Probably not. Renaming layers is still a good idea, but at least the Layers panel now looks cleaner. And there we have it! In the next tutorial in our Layers Learning Guide, we'll learn all about a special type of layer in Photoshop, the Background layer. We'll learn why the Background layer is different from other layers, the limitations we need to be aware of, and the easy way to get around them! Visit our Photoshop Basics section to learn more about Photoshop!